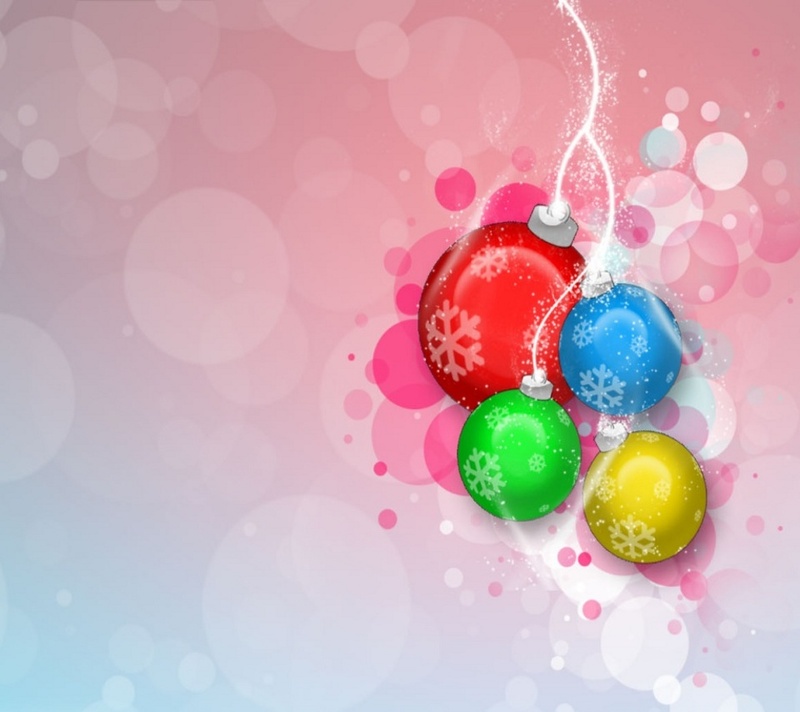 >A Christmas Tale Blogfest – My Special Christmas Wish….. 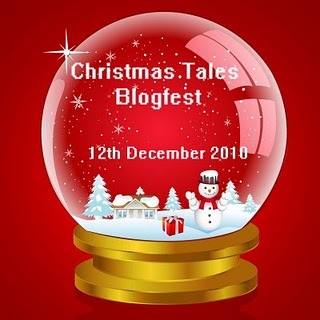 This is my entry for the Christmas Tales Blogfest hosted by Ellie Garrett. Be sure to go over and check out all the other entries….. When I decided to share some Christmas memories in the form of stories, I didn’t know what I was getting in to. I’ve gone off in directions I hadn’t expected and had to dredge up feelings and allow myself to be what I call emotionally naked. Something will pop into my head and demand to be written and I’m finding I have no idea what’s coming out until it’s there, no matter how hard it is for me. This one is very personal…. I’m going to ask you to do something. Please play the video, softly, then begin reading. This one is for my very own, real CindyLoo…. Things are kinda busy here, as You well know. It’s my favorite time of year and I really want to recapture that special magic that it used to have. Funny, isn’t it, how it’s my favorite thing I got from Mom, my love of Christmas….I wish she could be here but knowing she’s with You makes it alright. Tell her I said hello and that I love her, would You? 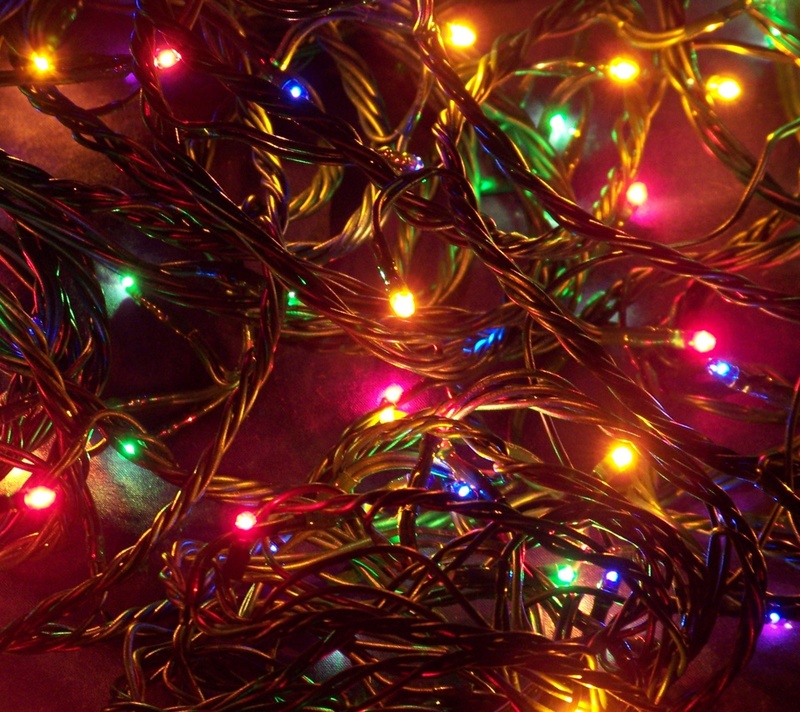 I have a blog now and for Christmas, I’m posting stories from (mostly) my childhood. It’s kinda scary, though, the way it’s turning out. Things are coming out of me I hadn’t expected. Like this letter…. I’ve been thinking a lot about Sister lately. She’s pretty much made herself unwanted with everyone else but me. I suppose because I can remember when things were different and she was a different person…. We used to spend whole days shopping at Christmas. Even when we had no money, we’d find ways to get everyone something. And we’d laugh the whole time. Do You remember the time with the race track for Brother? I wrote about that. She was a great Santa. Brother probably doesn’t remember – he was still pretty young. We always called each other on our birthdays. She never forgot to call…. She was the one who went with me to the doctor and she stayed with me when they told me I was probably going to die without immediate surgery. I was so scared. I wouldn’t have made it without her there. She was the one who drove me home, 11 days later, and we laughed about getting stopped for speeding and me getting taken in because I had lost so much weight and I looked like a junkie…all those IV’s. She wanted me in the hospital room with her when Niece was born. I’ve never witnessed anything as miraculous as Niece being born. My arms shook from holding her upright during her epidural….and she never cried out in pain. Not once. Even though the epidural didn’t take. Remember what a mess she was when First Niece was born and she came to live with You? I think that messed her up a lot….along with so many other things. Nephew has forgotten how she was all he had for so many years. He has a right to be angry about later; but for a long time…she was it. So much has happened….and I don’t know if it can be fixed. It would have to be You. She won’t listen to anyone else, not even me. And now…… now, it’s Christmas and I have no idea where she is except lost in the dark. I guess what I really wanted to say, well, to ask, was….would You send some angels to watch over her? To keep her safe? Would You whisper to her when she sleeps and tell her that I remember? That I know that locked under all the pain and anger and hurt and fear and regret and sorrow and loss….is the self she used to be? And that it’s okay to feel all those feelings and that it’s safe to come back out? Would You hold her in Your hand and make her feel safe and healed and whole? And would You do the same for Niece and Nephew? I miss her. I miss the she she used to be. I miss the we that we once were. But even if we could not be as we as we once were, I would wish that she could be the she You want her to be. That’s my Christmas wish, Daddy. I will hold all the memories in my heart and cherish them. I will nurture them with all my hope and love till that day the wish becomes reality…. It’s getting late and I need a tissue, so I’m going to end here. 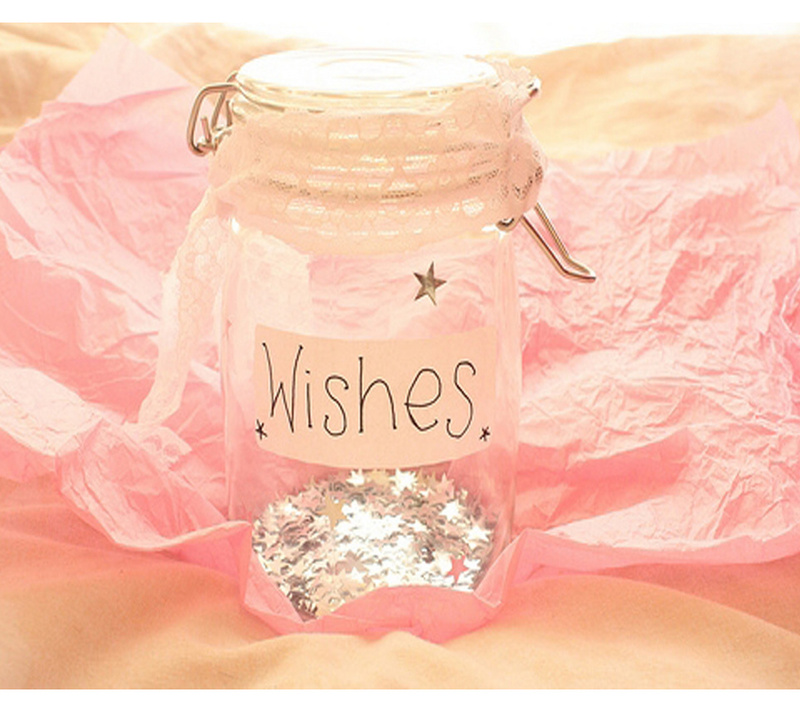 Just please, consider my wish…. My mom absolutely adored Christmas. She had a knack for it. Whether it was picking out exactly the right gift or decorating our little tree, she nailed it like no one else I know. No small feat considering our poverty. We grew every kind of food imaginable, except citrus fruits. My grandpa and uncles grew cattle, pigs, and chickens. Summers were for canning and freezing and working in the garden. We always had plenty of food. People Mom worked with, as well as an older cousin, were always giving us hand-me-downs, so we had clothes, too. We loved the hand-me-downs….it was like Christmas all over again! She was also quite the seamstress. Mom created dresses and jumpers and pant-suits for us till I was in the 5th grade…. I had no idea we were poor until the 7th grade when a friend asked why I didn’t wear Levi’s. What were Levi’s, I wondered? 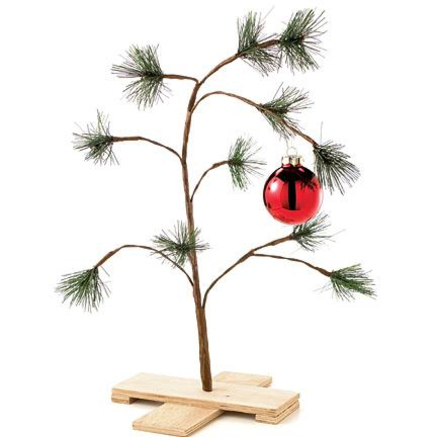 Our tree should have looked like this little tree. Not just in scrawniness, but with the same lack of presents. The magic would happen while we were asleep. We shared a bed, Sister and I, and we’d whisper far into the night about staying awake to see Santa and wonder about what he would bring. More times than I could count, we’d hear Mom call down the hallway and tell us to be quiet and go to sleep or Santa would skip right over us. Of course, we’d just go off into fits of giggles then…..
One of my favorite memories, one that held so very much magic for me, was the morning we woke and found a child sized table with two chairs….just for Sister and me! Sitting in the chairs were two dolls and the table was laid out with a tea set. That was the first time I truly believed Santa had been in our home and that he’d set up that table for us. Just for us! 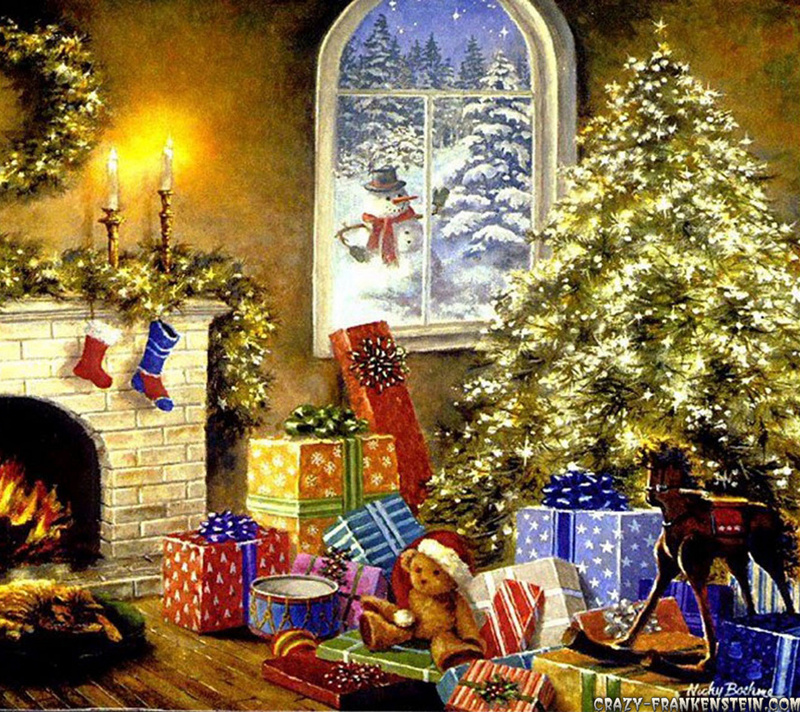 Our stockings had been stuffed full of candy and gum and crayons and coloring books….. I can close my eyes and remember the magic of that morning. My mom was pretty amazing at Christmas time. She was magical that way…. Now, knowing that she’s the one who took such care to make things special for us, that she had to sacrifice to do it, the memories I have of those Christmases are all the more precious to me. We may have been poor, but we always felt like we had an abundance….. The twinkling lights of the small tree cast merry shadows around the otherwise plain and sparsely furnished room. Only a few presents were placed under the tree and there were no stockings to be seen. At first glance, this seemed a sad setting for a Christmas Eve…. The air was bitter cold and the frosted landscape glittered brilliantly in the starlight. The two young girls, laughing at the struggle they were having with their unwieldy burden, watched their breaths appear like mystical vapor, then disappear. The grass crunched under their clumsy steps and the tiny ice patches caused them to slip as they navigated the uneven ground between the grandparent’s house and theirs. More than once they had to stop and tighten their grip, snickering at each other’s awkward attempts to remain upright. Smothering their laughter as they approached their home, they whispered excitedly about their hopes for success. They were playing Santa for their three year old little brother. He had been a “mistake” according to several upstanding community tongue wagers. Fierce frowns had appeared at the news of his impending arrival into the world. Unwanted. Unwelcome. Ill advised. Illegitimate. Those words didn’t stop him, though. He came into the world sideways and has set it on its ear ever since. And all those unkind words had to be eaten, eventually. That little boy came to be the apple of most everyone’s eyes, including his grandfather’s, the pillar of the community of tongue wagers. He became Grandfather’s constant shadow, his apprentice, his greatest source of joy, and continues to be greeted with genuine welcome by everyone he meets. Grandfather’s love for the baby brother is why the two sisters now carried a very large piece of plywood carefully up the steps of their front porch. For Christmas, Mom had gotten Brother a race track. A large but simple figure eight track that came with two super-fast cars that he would later spend hours racing with his sisters and his mom. To make the track more sturdy (and able to withstand greater speeds), the grandfather had mounted the track on a wooden platform. Finally, on the porch and ready to go inside and place the track by the small tree, the sisters opened the front door…..and the large, cumbersome piece of wood slipped. Nearly dropping it, one sister caught the end before it hit the floor, but in the process, they bumped the screen door loudly and began to giggle. Mom had a time trying to convince Brother that Santa would leave if he didn’t lie down and go to sleep, which he eventually did. The two sisters placed the track in front of the tree and, locking up, made their way to bed. The older sister knew that something magical had happened in those moments and vowed to remember it always.